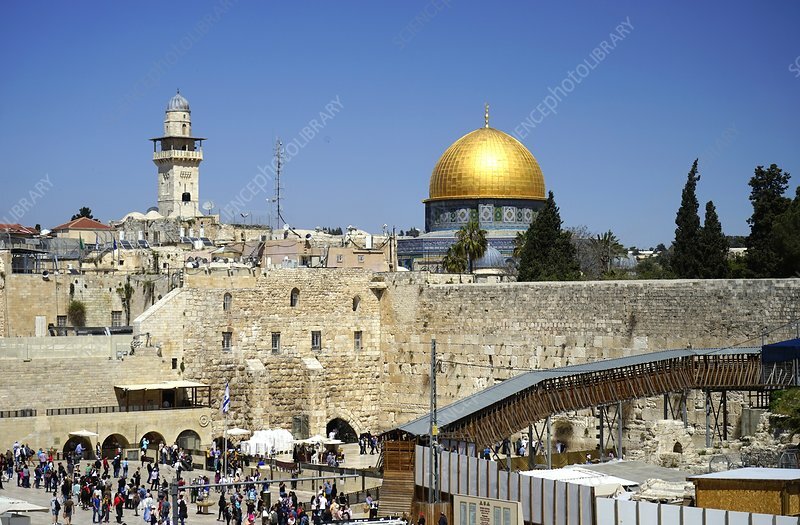 The Western Wall, also known as the Wailing Wall, and behind it the golden Dome of the Rock, Jerusalem, Palestine. The Dome of the Rock is an Islamic shrine located on the Temple Mount. The site's significance stems from religious traditions regarding the rock, known as the Foundation Stone, which bears great significance for Jews, Christians, and Muslims. It was constructed on the site of the Second Jewish Temple, which was destroyed during the Roman Siege of Jerusalem in 70 AD. Some Muslims believe the location of the Dome of the Rock to be the site of the Islamic miracle of the Isra and Miraj. The location is holy to Christians primarily because of the role the Temple played in the life of Jesus.